"Only by the practice of bhakti-yoga can one achieve the favor of the Supreme Personality of Godhead and see Him face to face (premanjana-cchurita-bhakti-vilocanena santah sadaiva hrdayesu vilokayanti). One cannot see the Lord by other means, such as karma, jnana or yoga. Under the direction of the spiritual master, one must cultivate bhakti-yoga (sravanam kirtanam visnoh smaranam pada-sevanam). 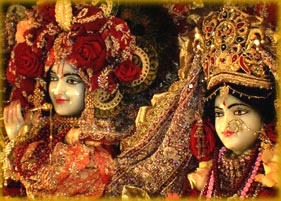 Then, even within the material world, although the Lord is not visible, a devotee can see Him. This is confirmed in Bhagavad-gita (bhaktya mam abhijanati yavan yas casmi tattvatah) and in Srimad-Bhagavatam (bhaktyaham ekaya grahyah). Thus by devotional service one can achieve the favor of the Supreme Personality of Godhead, although He is not visible or understandable by materialistic persons."